Ave Maria Press (Notre Dame, Ind., 2014). by Gina Loehr with Al Giambrone. The mountain of books written on St. Francis of Assisi testify to the enduring attraction of this saint, usually regarded as the most perfect follower of Jesus. Why two more such biographies? 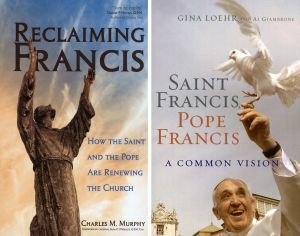 “Reclaiming Francis” and “Saint Francis, Pope Francis” aim to show us the spirituality of St. Francis, one that is very much alive in the church today, most significantly through the pontificate of Pope Francis. The authors outline in their books a living Franciscan spirituality for today. Gina Loehr succeeds at showing us how Pope Francis’ inspiration from the medieval saint offers us insights into our own Christian living. Her book, “Saint Francis, Pope Francis,” portrays the Franciscan lifestyle of charity adopted by Cardinal Jorge Bergoglio in his ministry to the poor in his native Argentina, and how he has carried this over to his pontificate. “A new clarity of vision had come to Francis when he embraced that leper. He conquered the fear and prejudice that previously prevented him from extending charity to this group of people,” Loehr writes. Pope Francis’ vision has likewise been clear when it comes to the poor. They are not a political cause, but children of God. The pontiff even takes it one step further, not merely ministering to the poor but, like Francis, becoming poor himself and thereby sharing in their lives. In “Reclaiming Francis,” Charles Murphy originally intended to show how St. Francis’ charism could inspire the new evangelization. He integrated the ministry of Pope Francis into this mission after the papal election. The author argues that humble service and dialogue leads to understanding others. This forms the cornerstone of evangelization. Like Loehr, he focuses on the joy that both St. Francis and the new pontiff possess. While Loehr touches on Francis’ love for nature, Murphy spends more time on this in his preoccupation with evangelizing. This fits into the ecological concerns that make the news and have become a great worry for many people, even in developing countries, and yet the author retains a Christian perspective. Murphy discusses Francis’ almost sacramental view of creation, and how the great saint saw nature, including not only the birds and the flowers, but also the rocks, fire, and even death, as kin. Murphy writes of the Franciscan vision: “Creation becomes more than something to merely master, as it enunciates the masterly artistry of God.” He turns to the words of Pope Francis, warning that money rather than man has become the lord of the world, even though we are supposed to be the stewards of nature and use it for the benefit of all while protecting creation. Owing to their preoccupation with a Franciscan spirituality for today, both books are rather thin on historical details surrounding St. Francis. The authors present him as floating in a kind of bubble, only connected to his historical circumstances and people through the vignettes offered, such as when the saint embraces a leper, or when he accepts Clare of Assisi by cutting off her hair and helping her to establish a parallel order for women. The risk is that, though these books are never intended to be biographies of the saint, without a strong connection to the real Francis and his time, Franciscan spirituality becomes abstracted from the genuine person and the Gospel itself. Perhaps this weakness, common to both, is compensated with the concrete inspirational facts and words from the life and spirituality of Pope Francis, as they both succeed in showing the greatness of this most humble man and his strong connections to people.